K.C. Conklin’s song “Sober” debuted in January, reaching the Top 100 on the I-Tunes Hip Hop Chart and grabbing more than 1 million views online and through social media. But that’s not the only amazing thing about this 31-year-old Wallingford resident. The real story is his comeback from the depths of opioid addiction with the help of Rushford and the Hartford HealthCare Behavioral Health Network. Conklin to health and town officials announced the Meriden Opioid Referral for Recovery (MORR) program. Fueled by a $2-million federal grant, it is a partnership between Rushford, MidState Medical Center, the Hartford HealthCare (HHC) Behavioral Health Network (BHN) and the City of Meriden fire, police and ambulance. The monies fund the purchase of Narcan kits for first responders, makes Rushford clinicians and caseworkers available to first responders and provides training to police on mental health and addiction, all as part of an overall approach to recovery that goes beyond the vicious cycle of treatment and relapse. More than seven decades after he served in World War II, John Faenza of Newington has received the highest possible military honor an American can receive from the French people. 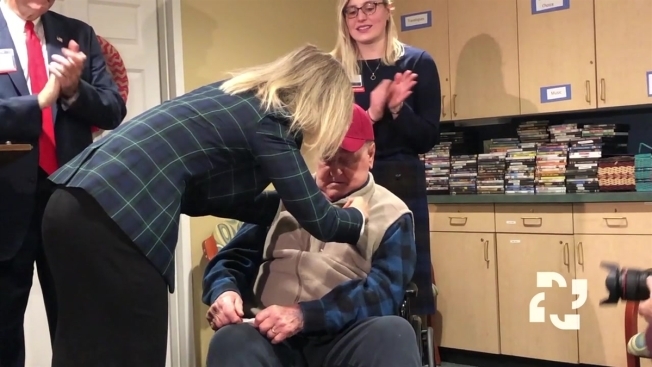 With his wife, children, friends and former co-workers by his side, the 93-year-old Cedar Mountain Commons resident was awarded an honorary French Knight of the Legion of Honor. “I’m speechless,” said Faenza, who was a sergeant in the U. S. Army during World War II, assigned to a bomber wing in France that helped liberate the country near the war’s end. French Consul General Anne Claire Legendre traveled from New York to personally pin this medal on a tearful and surprised Faenza. Learn more about Cedar Mountain Commons here. Like their human counterparts, canine law enforcement officers risk injury – even their lives – to protect the public. And Axel is a canine law enforcement officer in the form of a state-of-the-art, hands-on canine training simulator, able to simulate a gunshot wound, a blocked airway or a broken bone. He growls, whimpers and bleeds just like any animal in distress. His purpose? To help law enforcement handlers assist their canine partners should they be injured in the course of their work, and allowing handlers to train for real-life scenarios in the safety of a simulated setting. “When we saw this dog, we saw an opportunity to help our state, local and federal police officers, said Steve Donahue from the Hartford HealthCare Center for Education, Simulation and Innovation (CESI), where Axel will make his home. Learn more about the services offered by the Hartford HealthCare Center for Education, Simulation and Innovationhere. More than seven decades after he served in World War II, John Faenza of Newington has received the highest possible military honor an American can receive from the French people. With his wife, children, friends and former co-workers by his side, the 93-year-old Cedar Mountain Commons resident was awarded an honorary French Knight of the Legion of Honor.“I’m speechless,” said Faenza, who was a sergeant in the U. S. Army during World War II, assigned to a bomber wing in France that helped liberate the country near the war’s end. Learn more aboutCedar Mountain Commons here. His purpose? To help law enforcement handlers assist their canine partners should they be injured in the course of their work, and allowing handlers to train for real-life scenarios in the safety of a simulated setting.“When we saw this dog, we saw an opportunity to help our state, local and federal police officers, said Steve Donahue from the Hartford HealthCare Center for Education, Simulation and Innovation (CESI), where Axel will make his home. Learn more about the services offered by theHartford HealthCare Center for Education, Simulation and Innovation here.